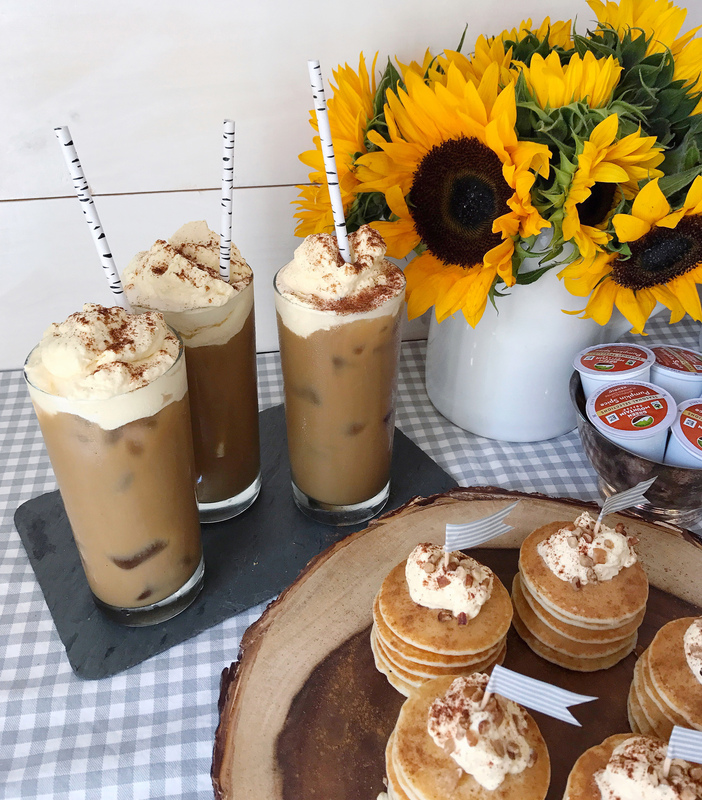 Iced Pumpkin Spice Coffee and Mini-Pancake Brunch. This post was created in partnership with Keurig Green Mountain®; all opinions, images, and content are my own. Alright, folks. I’m going to say something controversial: I’m really excited for fall this year. I know, I know, we still have a few weeks of warm summer weather to enjoy and I shouldn’t wish it away. 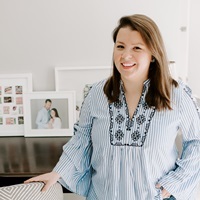 But as soon as I walk into a big box store and see those aisles of fresh school supplies and plaid scarves and cozy sweaters I get so thrilled. Not to mention those fall flavors that are popping up on shelves too, tis the season for pumpkin spice after all! If you’re a summer fan though, don’t worry. 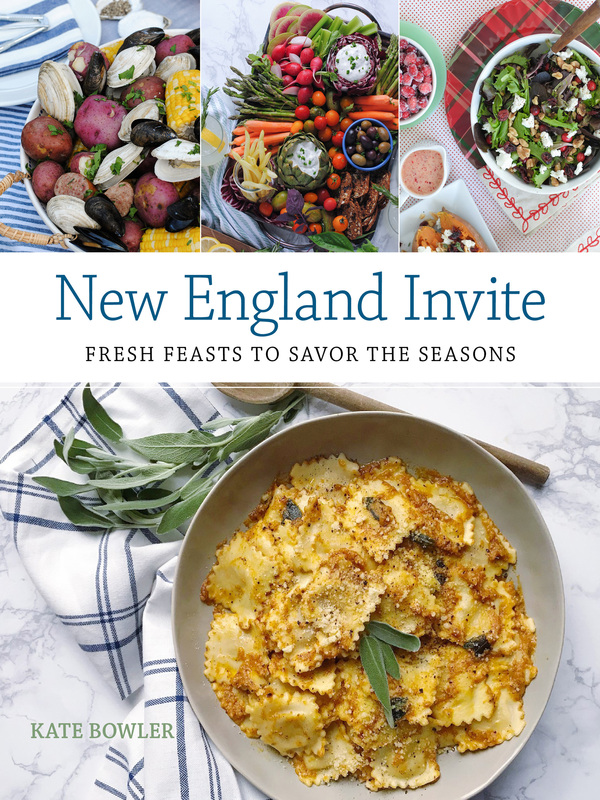 I read that meteorologists are predicting an unseasonably warm fall. I’ve got the perfect solution to make fans of both seasons happy: you can have your pumpkin spice and your iced drinks too! 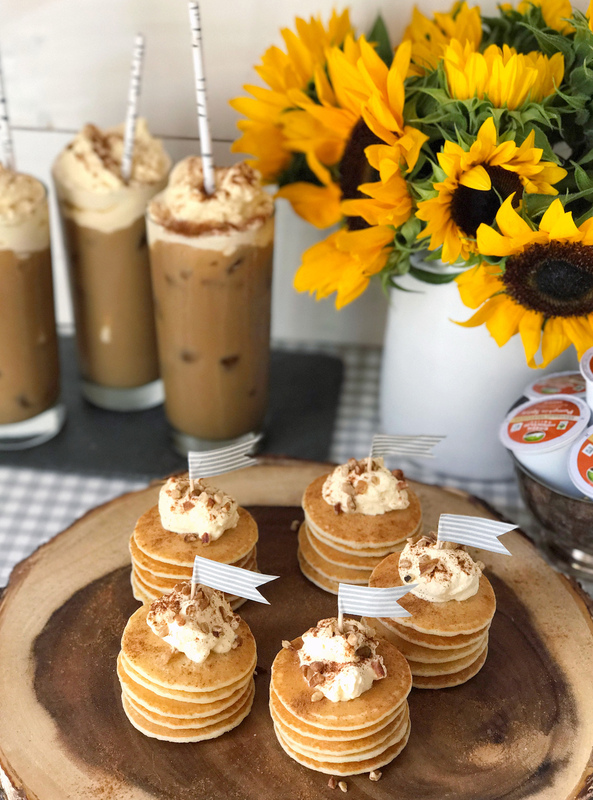 I have a few fun ideas for adding the pumpkin spice flavor to an easy, and festive weekend brunch display even when the weather is still warm. 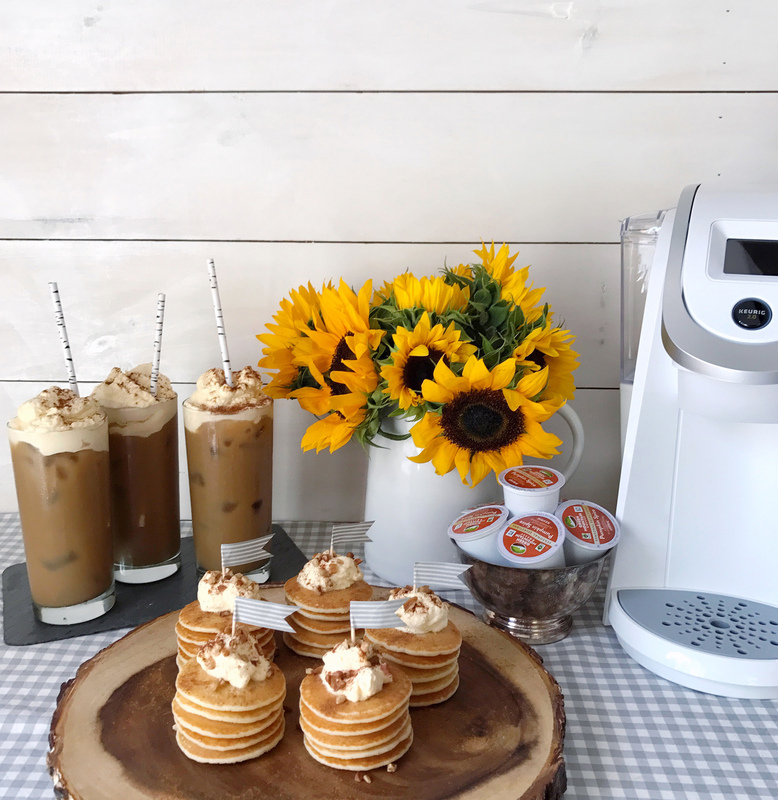 Let’s start with the iced pumpkin spice coffee: I made a few cups of this essential fall flavored drink with my Keurig® K250 Coffee Maker and Green Mountain Coffee® Pumpkin Spice Coffee K-Cup pods. If you’ve got time, place the coffee in a pitcher and chill it in the fridge before serving. 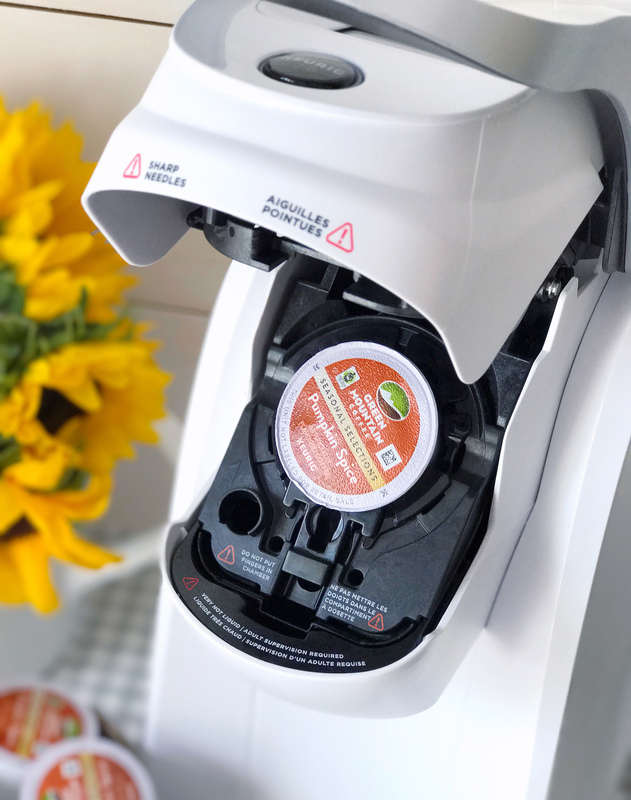 If you want to serve it immediately from the Keurig® K250 Coffee Maker, consider making a batch of Green Mountain Coffee® Pumpkin Spice Coffee the night before and freezing it in ice cub trays. When you want to cool down the warmer coffee quickly, simply pour it over the pumpkin spice ice cubes so that you keep the delicious flavoring and don’t water down your drink. 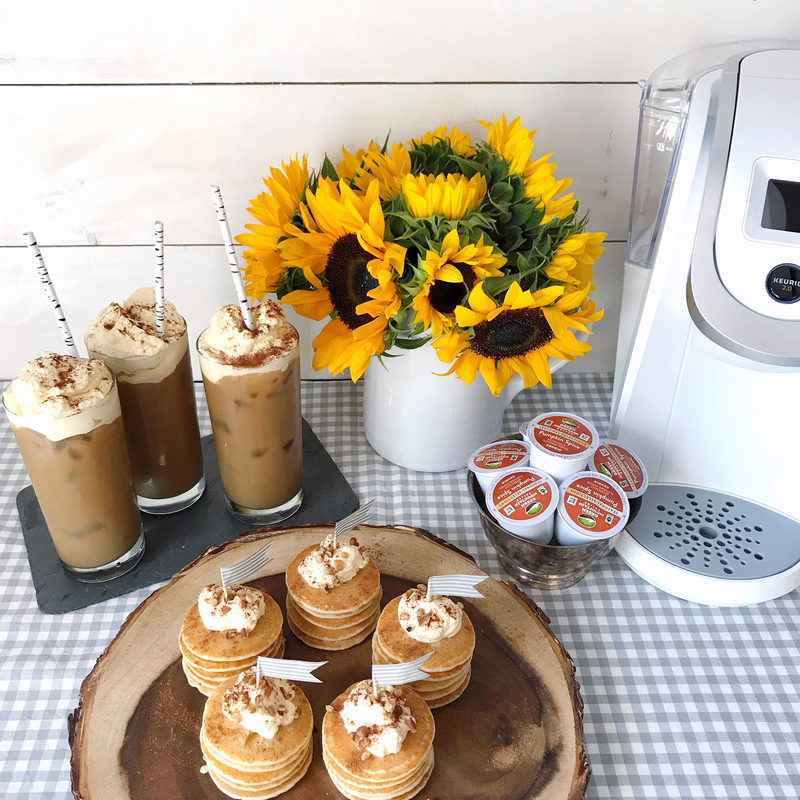 It’s a quick little trick that will impress your guests and make for some extra delicious Green Mountain Coffee® Pumpkin Spice flavored drinks. To add a bit more of that pumpkin spice flavor to the mix, I topped each iced coffee with a dollop of pumpkin-spice whipped cream. Whipped cream is one of the easiest things to make, and you can alter the flavor with a few tiny mix-ins to enhance your coffee drinks. In this batch, I combined one cup of heavy whipping cream with one tablespoon of confectioners sugar, two tablespoons of pumpkin puree, and a few dashes of cinnamon and nutmeg. 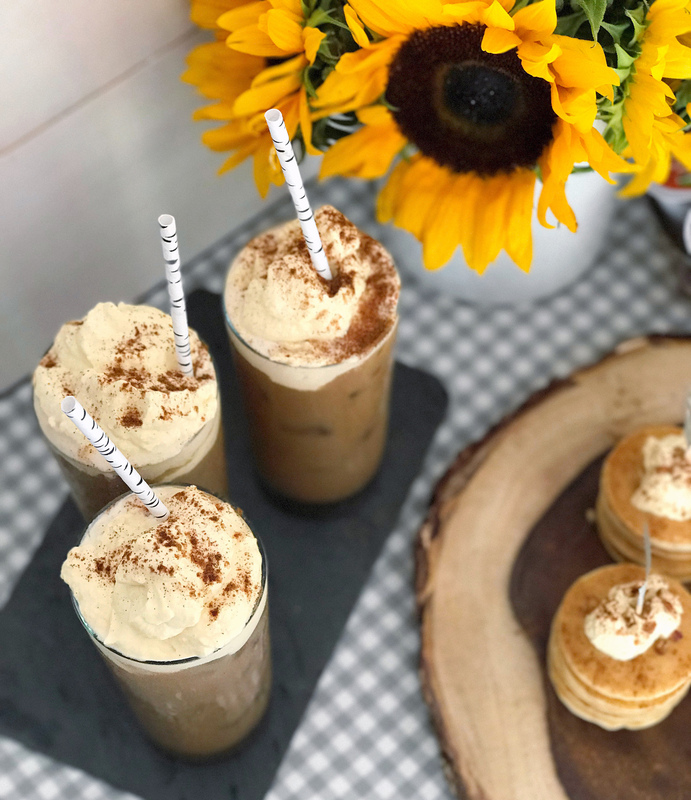 Use a hand mixer to blend it all together until soft peaks form, and use it to top off your Green Mountain Coffee® Pumpkin Spice iced coffee drink. 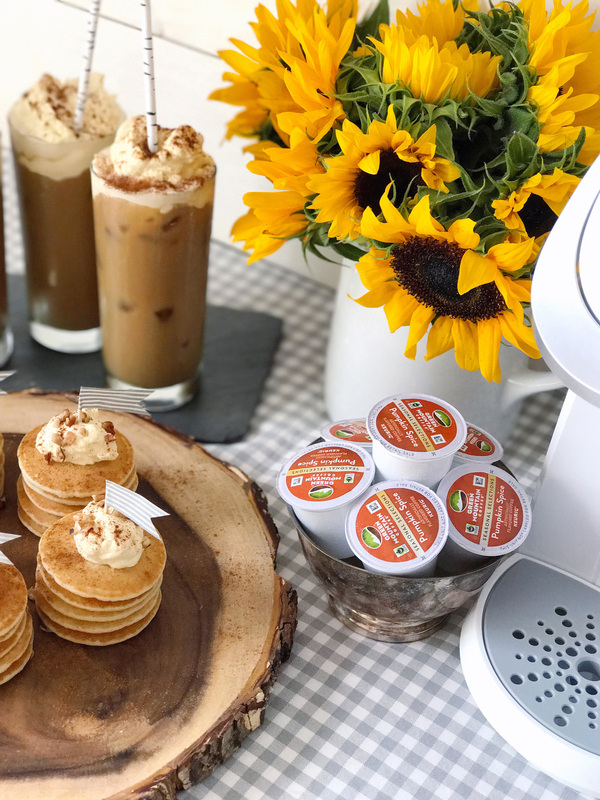 Since I made that tasty pumpkin-spice flavored whipped cream, I used it to add the same seasonal flavors to a simple stack of mini-pancakes for an easy brunch-time snack. These stacks of mini-pancakes are a favorite entertaining trick of mine: you can find small frozen pancakes in the freezer section of your grocery store. Heat them up before guests arrive and display them on a tray stacked up high with a scoop of the pumpkin spice whipped cream, a dash of extra cinnamon, and chopped nuts for extra flavor and texture. A cute little toothpick flag holds the stacks in place and makes for a festive bite-sized brunch addition. So tell me, are you ready for fall? Or are you hanging onto your iced coffee and sunshine filled days of summer? Traveling with Baby. Meal Planning Tips and Spicy Chicken Thigh Rice Bowls. 4 Responses to "Iced Pumpkin Spice Coffee and Mini-Pancake Brunch." Those mini pancakes are TDF. I’m not ready for summer to go away but I do love fall!